Честито на Даниела Овчарова! Току що си спечели ваучер на стойност 100лв за покупка на обувки от Онлайн магазин Ivanova. Ще се свържем с теб до края на деня! Hello, guys! This Giveaway was for my readers from Bulgaria only, but next time I'll make an international giveaway for everyone. Hope you all are doing well, new outfit post is coming soon, so stay tuned! I love your blog ! 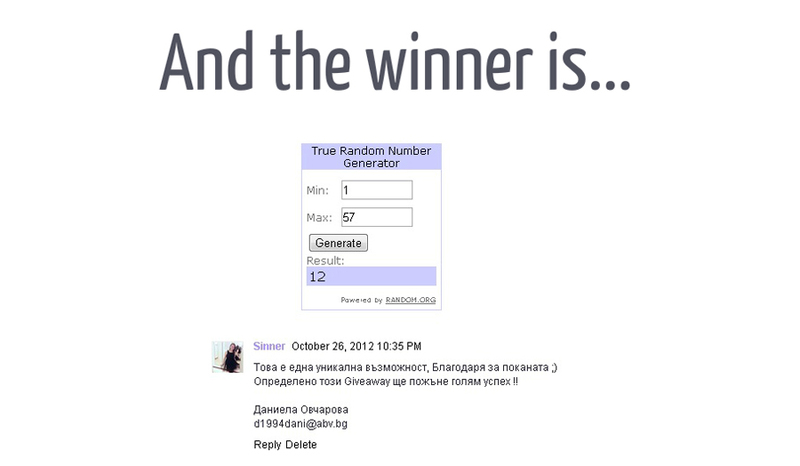 Congrats to the winner ! Thank you so much for your comment and I think it's awesome where you do some giveaways! Gives readers excitements, I wish I could do it someday! I would totally love to follow each other! In fact I've already did, so hope you will do as well, thanks! Thanks for following my blog! Followed back! Hope to win the next giveaway! Just want to inform that I follow you now on GFC and bloglovin!! Hi darlin! Just found your blog and am your newest follower on GFC #618 and bloglovin! It would be great if you could check out my blog and follow back (if you'd like:)! Thanks! thanks for leaving me a comment!! I think your outfit is very nice!! Your hair and your sunglasses go together really really well!